My name is Morgan. I’m 13, and vanilla bean ice cream is my favorite. I read HOUR OF THE BEES because my mom read it first and recommended it. My favorite part of the book was Grandpa Serge’s stories. You didn’t quite know if they were true or if he made them up, and I really wanted to find out. I would have talked to my parents about it instead of hijacking the car without a license and driving to the nursing home! I would say that it is very interesting, very unique, and I didn’t want to put it down. I think the book is more exciting than the cover. Yes, because I’d like to see what happens to Carol and her family after their experiences with each other. They went through a lot and it would be interesting to see how it changed them as a family. RULES FOR STEALING STARS because the main character is dealing with a sick family member and ends up somewhere magical. How did you come up with the stories Grandpa Serge told? We asked Lindsay that question, and here's what she told us! The stories that Grandpa Serge tells Carol were my favorite parts to write in HOUR OF THE BEES! I loved them for three reasons. First, when I was making up the stories, I knew I could be as weird as I wanted, and I really let my imagination stretch far. A magic healing tree, an oasis in the desert, bees who steal a lake.. All of it, weird and fun! Second, my own grandpa and father were great lovers of stories, especially myths and tales for children. Writing Serge's stories felt like writing a tribute to them. And third, stories are magical. They allow us to believe the impossible, make crazy things seem real, make our hearts thump and our brains spark. 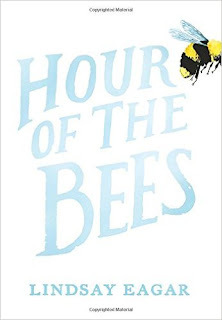 HOUR OF THE BEES is a book about stories, real stories and made-up stories. They're all important. Thank you, Morgan and Lindsay!